The sunbathers who baste themselves as they sit on the seawall of Revere Beach Boulevard have a new view this summer. Gone are the teen drivers swinging souped-up cars into tight, angled parking spaces, leaving their trunks open to pump thumping bass lines from their speakers. In their place are orange cones, confused motorists, and a massive construction project that has chewed up 1.5 miles of the boulevard for the entire summer. "This is ridiculous," said Emine Gecer of Medford, who was sitting along the seawall, eating strawberries and cherries with a friend on Thursday evening. "The whole summer?" The project promises to bring to life a grander, tidier boulevard. Landscaped, well-lit, and well-groomed, the Revere Beach Boulevard of the future will feature a broad, newly contiguous sidewalk that will allow joggers and power walkers to motor on without weaving between parked cars and darting into traffic. But the work has proven to be a nuisance for some motorists, who are stymied by the temporary one-way traffic restrictions that force them along a no-way-off stretch for about a mile north of Kelly's Roast Beef. Some restaurant owners gripe about the work cutting into their vital summer season. "We are not happy," said Nihat Aktas , a co-owner of Santorini Restaurant. Business has been cut roughly in half, he guessed, since construction turned the remaining beachfront parking spots into an unlined jumble of dirt, sand, and rubble. Still, he and other Revere residents appreciate the impressive sidewalks already completed, and he said he hopes the work will pay future dividends. "I think next year we are going to do better business -- I mean, I hope." 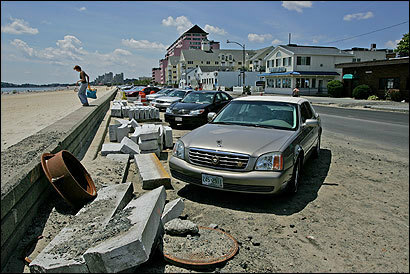 Revere Beach enthusiasts have dreamed about improving the aesthetics of the boulevard for more than three decades. But they finally received funding in 2004 when Revere's former state senator, Robert E. Travaglini, was Senate president. Additional funding arrived last year, after state Representative Robert A. DeLeo of Winthrop, who represents parts of Revere, became chairman of the House Ways and Means committee . "It helps to have friends in high places," mused Mayor Thomas G. Ambrosino. The project, run by the state Department of Conservation and Recreation, which manages metropolitan beaches, parks and parkways, has swollen from $6 million to nearly $11 million, and been delayed by the discovery that the water pipe below the sidewalk was so clogged that several fire hydrants were not working. The added work pushed back the project's completion, originally projected for late summer, to the distant spring. "The whole project should be done by early next year. But you can't do most of this stuff in winter, especially on the coast. The weather gets too harsh, windy. And to stop and start construction on a project like this increases the cost," said Wendy Fox , Department of Conservation and Recreation spokeswoman. "What we're hoping -- what we believe -- is that this will be so worth it." Revere residents, resigned to the traffic entanglements of this season, echo that sentiment. "It will be done soon and when it's done, it will be beautiful," said Eileen Rosen , a resident of the Jack Satter House for senior citizens, which is located on Revere Beach Boulevard. The renovation aims to tame one wild aspect of the roadside beach by erasing about 250 angled parking spaces that provided quick, free, access, but were viewed by some residents as messy and dangerous. Some parallel parking spaces will replace the angled spots, and the beach is still accessible from three nearby T stops and paid parking lots. "Angle parking is a thing of the past," said Ambrosino. "It encouraged kids to pull up to the seawall, pop open the trunk with the speakers and blare the music." Whether parking patterns prove to be a deterrent to loud beachgoers remains to be seen. Many Revere residents remember the days and nights when they were the ones hanging out at a bygone spot for teens called Punks Corner. They said they hope the nation's oldest public beach will remain freely accessible to all. "The kids are coming. Nothing's going to discourage those kids. They're kids," said Victoria White , 73, who lives at the Jack Satter House. The construction project is the latest in a series of improvements being made at the beach. Wednesday nights are movie nights on a big screen on the beach. The farmer's market opens July 19. The city recreation department offers sea kayaking lessons. And this week marked the start of the annual New England Sand Sculpting Festival, run by the not-for-profit Revere Beach Partnership, which has been lauded as a model for other down-on-their-luck city beaches that have lost state funding. The construction can only bring more good investment to the northern side of the beach, Ambrosino said. "I think it will just be an aesthetically more pleasing place, more attractive to developers. And we are looking at more development at that end of the beach." Last month, the Ocean Club, a luxury, resort-style high-rise, complex, with a promotional website that makes Massachusetts Bay look like the Caribbean, broke ground . But advertising and glossy beachside refurbishments can only do so much to promote an urban beach that is often unkempt, visitors say. Though the ocean is cleaner now than anyone can remember, trails of seaweed and sooty-looking residue punctuate the high tide line. Litter was limited on recent visits, but rocks and debris go unraked. "I think it's still dirty and disgusting," said Gecer . Revere Beach's many die-hard fans do not expect it to be pristine. The action is what they crave. Jets roar overhead, helicopters whirl by, and an amusement park atmosphere always hangs faintly on the breeze. Brenda Ferola , 50, of Malden, wearing shorts and a bikini top that held her cellphone, paused from her daily power walk on the beach to contrast the Revere Beach experience with her recent visit to the beach in Nahant, which she found disappointing. No Kelly's Roast Beef. No condo towers to gaze upon while she walked. "It's just a beach," she said dismissively. "This is Revere. This is people." Your memories of Revere Beach?